The International Olympic Committee (IOC) has today lifted its suspension of Russia, the organization has confirmed. The decision was announced by Russian Olympic Committee (ROC) President Alexander Zhukov, who said that the remaining doping tests on the neutral Olympic Athletes From Russia (OAR) team had come back negative from Pyeongchang 2018. 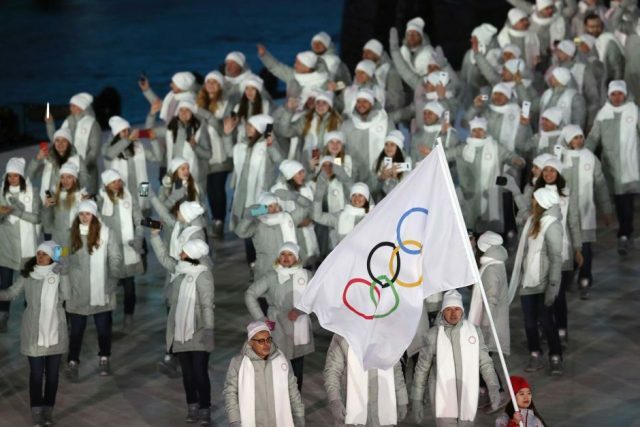 Russia was suspended and forced to compete under the OAR name at the Winter Olympics in South Korea this month due to their “systemic manipulation” of the anti-doping regime at Sochi 2014. Two failed drug tests by Russian athletes at Pyeongchang 2018 proved key in the suspension not being lifted in time for the Closing Ceremony. An IOC Executive Board ruling on December 5 had said that the ban could be lifted before the Closing Ceremony – meaning Russian athletes could march under their own flag – so long as they had honored the “letter and spirit” of eligibility requirements. Nicole Hoevertsz, who chaired the OAR implementation group, then claimed the suspension could be lifted between 48 to 72 hours after the Closing Ceremony, which took place on Sunday (February 25). On the day of the Closing Ceremony, her group recommended the suspension be lifted immediately once the IOC received notification from her that there had been no further positive doping cases involving any of the OAR athletes. The confirmation today means Russia have been reinstated just three days after Pyeongchang 2018 ended. “Today we received a letter from the IOC about the restoration,” said Zhukov. “The restoration of the ROC was connected with the end of the doping tests from the Olympics in Pyeongchang, the IOC can confirm that all other results are negative. The letter was sent by Pere Miro, the IOC’s National Olympic Committees relations director. “On behalf of the Olympic Athlete from Russia implementation group, I wish to inform you that, following the IOC Executive Board decision on February 25, 2018, the final notification has now been received from the Doping Free Sports Unit and the IOC can confirm that all the remaining results from the OAR delegation are negative,” Miro wrote. “Consequently, the second point of the IOC EB decision on February 25 comes into effect automatically and immediately. An IOC spokesperson has since confirmed the suspension has been lifted. Two members of the OAR team at Pyeongchang 2018 tested positive for banned substances, which Hoevertsz described as “individual ones” which were not evidence of a systematic approach. Nadezhda Sergeeva tested positive for banned stimulant trimetazidine after finishing 12th in the two-woman bobsleigh event, where she had been the pilot with partner Anastasia Kocherzhova. Aleksandr Krushelnitckii was earlier stripped of his mixed doubles curling bronze after failing for meldonium. The lifting of the suspension comes despite the Russian Anti-Doping Agency remaining suspended by the World Anti-Doping Agency. Several IOC members expressed their desire to “draw a line” under the doping saga through the Executive Board’s decision. New Zealand’s Barry Maister and Canada’s Tricia Smith, however, called for more to be done before the suspension could be lifted. Several organisations expressed concern when the IOC stated they would look to reinstate the ROC after Pyeongchang 2018. Jim Walden, the lawyer for former Moscow Laboratory director Grigory Rodchenkov, also hit out at the decision. Much of the evidence surrounding Russia’s doping scheme came from Rodchenkov, who turned whistleblower and is now in hiding in the United States. “In the decision, the IOC had the gall to claim Russia ‘respected’ its decision on December 5 to institute the suspension,” Walden said.